The first shirt is selling so well I decided to continue on and introduce this 2nd shirt in the ENDO Apparel lineup. Show your disgust with unconstitutional firearm laws in California and wear one of these bad boys around. I believe this shirt is subtle enough to wear around anti-gunners / hippies without stirring the pot too badly. Make sure to read my artsy hipster statement about the shirt on it’s product page. These are screen printed on the same type and color of American Apparel 50/50 poly/cotton shirt as the last one. I got a ton of feedback from a lot of you that bought the last shirt, and the consensus seems to be that wearing the shirt is as comfortable on your skin as wearing lotion. If you’re looking for a size that I don’t have, make sure to email me and i’ll try to accommodate you for the next order! I really appreciate all your continued support. Have a great weekend! It’s unloaded open carry, and they tried to outlaw that too. there is “no” open carry here in Cali. Was outlawed in 2012. Is the tshirt made in the USA or China? USA! Everything American Apparel sells is made in downtown L.A. Problems with American Apparel are. A: The people working for them in L.A. are illegal aliens. B: 80% percent of Americans don`t physically, socially, or cosmetically fit into AA`s product demographic or carrier hiring criteria. I can tell you I can not fit into there clothes and being smart enough to make my own ammo, among other things, excludes me from the AA club, except for the American Government, LOL. C: There CEO is a freak!!!!!!! You got to start looking at where things come from, not just clothes but, food to. Most of Whole Foods frozen food brand 360 came from China and only just stopped importing it because the story broke. Every time you buy something from a company that manufactures in China you are putting money into China`s pocket and promoting Made in China. YOU ARE HELPING A COMMUNIST GOVERNMENT!!! Now even the “sacred guns” are being made in other counties, Tarus of brazil, Spring Field XDs in Eastern Europe, Sig, Glock, Etc. China has replaced us and I am learning to coup with it when the real consequences catch up with us in the next two years. My advice is buy what you want now because your money will be worthless when China and the other manufacturing nations find a way around our worthless dollar. We flood the world with our paper money, yet we do the opposite with our products that you can`t find anymore. China on the other hand has a small amount of there paper money they tightly control, yet every product in the world is made in China. We could learn something from them since we seem to have forgotten the economic model we created. FLOOD THE MARKET WITH AMERICAN MANUFACTURED GOODS. I have woken up from the 40 year dream we have been in. We have destroyed ourselves. I will be the first to admit. AMERICA IS NOT #1 ANYMORE. I don`t know what number we are anymore, maybe #4. And, maybe if you admit that, we can start dealing with our problems. Considering the deficit, we’re far worse than #4. The bill just hasn’t come due yet. China owns us. If we stop buying their goods, they stop bailing us out. That happens, we start riding donkeys to work…if there is any work. But, we keep spending ourselves into a hole (thanks, DC) – so maybe we need a national trauma moment to start making our way back up the ladder. Either way, America will continue to spend and import its way into oblivion unless a Libertarian or Tea Party President and Congress are implemented to reverse the process…which will also never happen since they are all labeled as crazy. Everything American Apparel sells is made in downtown L.A.
MADE IN AMERICA, by illegal immigrants. B E A U T I F U L… just beautiful. Just placed an order for a large. Keep up the stellar work. 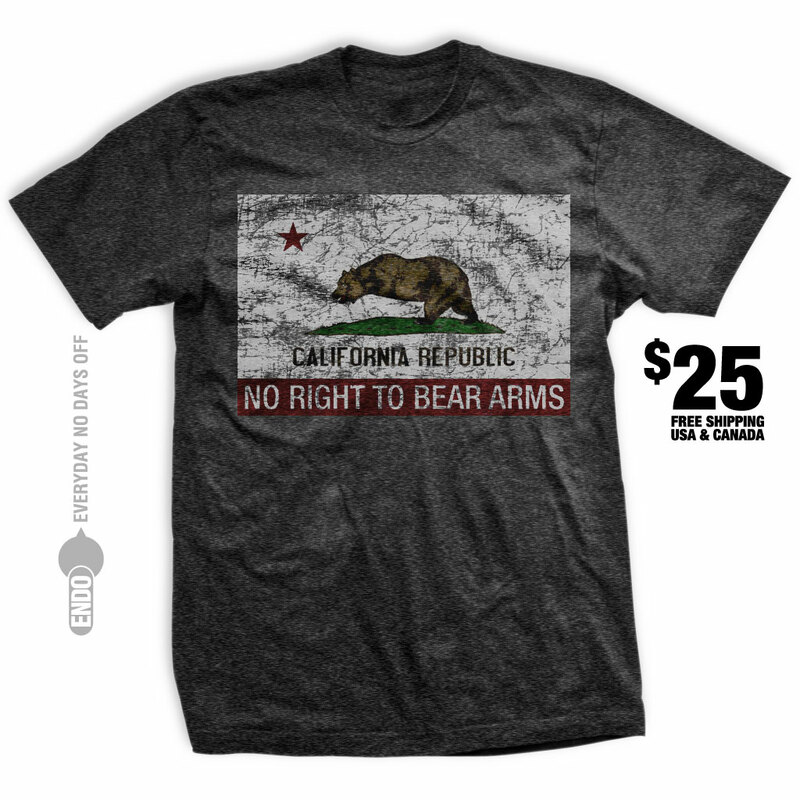 It would be nice to get one with a back or a side print of a Cali flag -bear arms from the back that would sell me. A side print or a back decal looks allot better on a man then a chest decal. I’ll keep it in mind, but I honestly think front designs are more popular. If you wanted a “one off” backprint I could definitely include it in my next order as long as you paid in advance. Can you do one without the words “No right to bear arms”? It’s a little more subtle, but when you’re caught behind enemy lines like we are, subtle is good. I was considering it… but to me that seemed TOO subtle. I’ll give it some more thought though for sure. Looking good. I’m in for an XL when I get home from work tomorrow. ps You should make stickers of this too. Cool, thanks Jamie I’ll keep an eye out for it. I’ll look into doing some stickers. If I lived in Cali I would rock it but I think it would be out of place here. You could still buy it and show your solidarity! If I had an account over at Calguns i’d post this for you. The guys there would go insane over this design! Someone really needs to do that. Oooo yea that would be nice. I don’t have an account either, and they would probably frown upon me creating one just too do some self promotion. You guys hit the nail on the head with this one. Just placed my order. Thanks RK, i’ll get that out soon. I like it, but it needs to look more…. more disgusted in the ways of the Californian bullcrap. This shirt needs to be borderline offensive. I’d buy it if i wasn’t broke, and if it was made in some other place than downtown LA. Downtown LA is just as bad as New Jersey. This is great. But I must agree with That One Guy. That shirt needs to be more offensive and express more disgust with their absurd gun laws. I am looking to get my gun permit here in NYC and man what a convoluted process that takes FOREVER!! I can see the antis picking this up as well. That never crossed my mind when I was making it, but I could see it happening now that you mention it. Over on top of a picture of a glock with a stock? I want to represent! GIVE ME THE MEANS TO BE REPRESENTING. hahah i’m working on it! That’s the funniest pro-2nd amendment related shirt I’ve ever seen. It’s great because it’s thought provoking, and it doesn’t even have a picture of a firearm. Nice design. If I still lived in CA, I’d definitely wear one. I’d look funny wearing up here in OR, however. Come on Mike, get that polo shirt made already, I need one I can wear to work! I can’t be an elite cubicle operator with out an ENDO Polo. I’m thinking of different types of shirts like polos. But I just don’t know how many people besides you would be interested. Would you be happy with what I have for current designs printed on the back or front of a polo shirt? Because I can easily throw that in the next order. Damn Mike! Now I have to order TWO shirts! Once I get back from my hunting trip (and having to use this iPhones unbearable Safari) I’ll definitely order them! I may even get one for my Dad, he’d love this one! I’m looking forward to your order! Hope the hunt is going well. What, no peg legs? I would totally be all over this is if I didn’t live in Western New York. Our laws are more ridiculous than California’s. Very cool concept and design. Thanks Steve! I agree, NYC seems pretty ridiculous from what I read too. I like the design a lot, very clever and kudos. AA shirts conform a little too well to my figure and I can’t go around sucking my gut in all day. I would consider it if I could be sure that one size bigger would fit well but I’m not sure. Thanks Chris. They don’t make a 3XL in that shirt design unfortunately. I’m still looking into other brands that are comparable in look to accommodate people that need above 2XL. Hope you come up with more clever and funny T-shirts and maybe bumper stickers. Thanks Tom. I’ve got many more shirts in the works. Bumper stickers too. Right on Mike! Just fired off my order. Keep up the good work and thanks again. Thanks Ryan, I’m mailing it out today! I look forward to the day when I’ll have to explain it to my kids. Things are changing here for the better. Even if it’s slowly. ENDOapparel.com Tino! I have them in stock currently. Also stickers too if you’re interested. CA is an amnesty state. That is why the Demo control about 90% of the politics here. CA is what the country will be if the “undocumented imigrants” across the country are granted amnesty. The Demo will rule everything because they are the ones pushing for it so they will get votes and control both houses and the presidency in 2016.